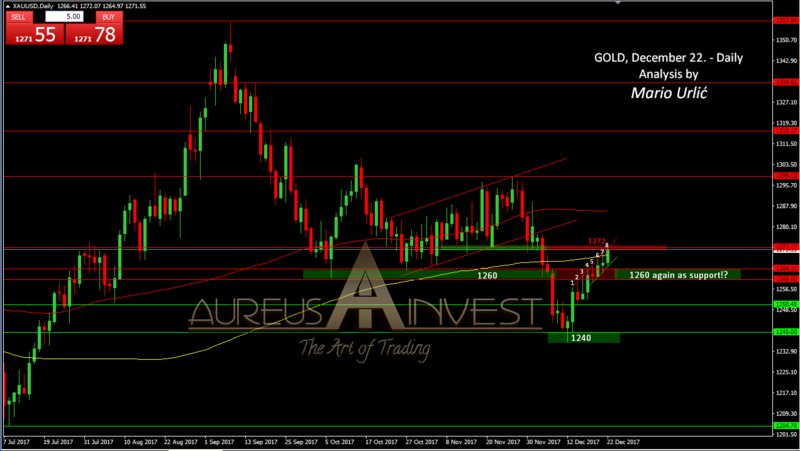 For 8 trading days in a row the buyers are reaching the new high on gold, slowly breaking the resistance level at 1260/65 and reaching the new one at 1272 today. Is this all for 2017 or they will push the precious metal even higher, we will see, but it looks like they have returned the lost teritory. From this point, 1260 level could become a strong support level again, especiailly if they close the price above daily MA200, which is at 1269 today. On the way back, 1265/67 is first support, follows the strong one at 1260/62. If they break this resistance at 1272, as I have pointed in my chart, I don’t see nothing stronger before 1300 level.